“Why on earth is the title menu using over 400 megs! ?” Nassim blurted! “Must be that new flying bat technology® you added”, Amir joked. But this was no joking matter. Klep was using way too much memory just to load the title menu, and they had to figure out why. It’s true what they say, there’s no such thing as a routine Poez meeting. Well, maybe no one says that but it’s true nonetheless. They slowly sipped their favorite drug, caffeine, amidst a surprisingly sunny fall afternoon. The barista was loudly preparing yet another concoction and with the loud bangs of the poor portafilter, they both felt pity for the memory being used and abused…. Nassim finally broke the silence, calmly uttering “It’s probably a leak… but let’s look at the profiler!”. He pulled one of their engine profiling tools and hit play…. Both waiting for their questions to be answered as they focused onto the screen. The numbers started filling their empty table, pyramids materialized on the charts. “See! that downward slope is the engine offloading to the graphics and audio api’s!” Nassim couldn’t help explain and showoff another “efficient” aspect of their technology. The game loaded and the data was in. They hit pause and started running through every row of numbers, hoping to glean a glimmer of grand hope that would tip them towards the possible culprit of the high memory consumption. To which Amir chuckled and explained the actual reference… But their tangent discussion was quickly interrupted by the problem at hand. 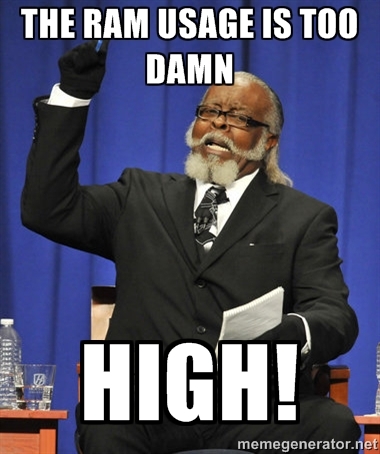 The Ram Usage was in fact too damn High!